This is a quick read that deserves the title "Rapid Reads." It's length doesn't detract from the pleasure of reading it, however, you just get the enjoyment in a quick little bite. This is the second book from this line that I've gotten so I looked at the publisher's website and it says this line was developed for adult ESL students, reluctant readers and adults who struggle with literacy. I really like that! I think this is the perfect kind of book to get an adult with literacy issues interested in reading. While the language may not be challenging, the plot line and characterizations would not be insulting to adult learners. I think there's a real place in the book world for this idea. Anything that gets more adults reading is a good idea to me. 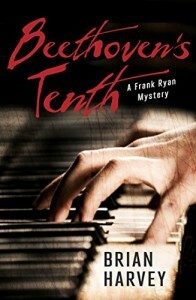 Frank Ryan, a piano tuner by day and a jazz pianist by night, is working for one of his favorite elderly clients when instead of paying him in cash she pays him with an old manuscript. It's not what he wants but there seems to be no choice so he takes and it and, surprise! It's Beethoven's lost Tenth Symphony. Obviously other people are going to want this thing and come after Frank with a vengeance. This world of crime and violence is not what he's use to but he manages it pretty well and I found it pretty entertaining. Frank is a really fun character with an interesting personality, fun and engaging. I would have given it 4 stars but the ending was a bit predictable for me so I gave it 3 1/2. This would take about an hour to read if you were uninterrupted and my first thought, before I knew why this line was written this way, was "Why would I want to read such a short book?" I like books I can lose myself in for hours and days. But I've decided what a really good use for this type of book would be. I'm going to put it on the night stand in my guest room. All my guests are readers and they all love a good mystery. This would be the perfect thing to read if you found yourself somewhere and forgotten to bring a book or had finished what you brought. It's light, it's quick, it's entertaining and I would be quite willing to read more about Frank Ryan. I received this book through LibraryThing's Early Reviewer program in exchange for an honest review.